The Tales from the Borderlands game was announced in December 2013, and now its developers - Telltale Games company - is ready to present the first details of the upcoming project. 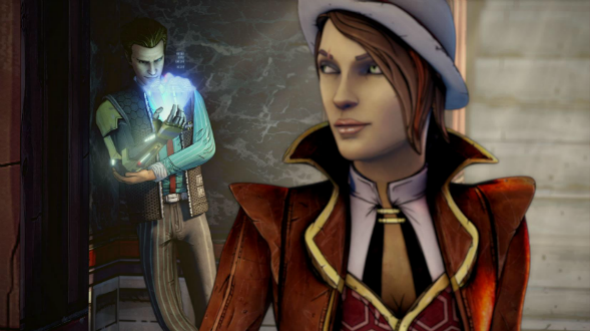 According to the information, the events of the future adventure game are set after Borderlands 2. However unlike the original series, the main characters in the Tales from the Borderlands game will be the simple inhabitants of Pandora - the con-artist named Fiona and the Hyperion employee - Rhyse. According to one of the Telltale Games’ founder - Kevin Bruner, - the Tales from the Borderlands game will be more humorous and funny than other company’s projects like The Walking Dead and The Wolf Among Us. Besides, the protagonists - Fiona and Rhyse - have the unique abilities that the players definitely would like. Thus, for example, one of the Rhyse’s hands is robotic, which helps him to hack any computer system. Bruner has also mentioned that during the gameplay the users will “never play what actually happened”. They will have to rely on two totally different versions of the one story, told by the main characters. And in the end the players must decide whose words were more truthful. So, will the Tales from the Borderlands game become popular among the fans of the Borderlands universe? What do you personally expect from the upcoming project? What Tales from the Borderlands: Episode 4 is about?